I have had a few shocking eye-openers recently. Some people I had called friends, even ‘best’ friends, showed off their true colours – and as you can probably understand from the tone of this message, it was not in a good way. Honestly, it’s very disheartening. After years of me investing into these friendships, I’m only finding out now that they are not trustworthy or were just using me for what they could gain. Yes, I may be a nice, thoughtful person, but that doesn’t make me a push-over and I do have limits. So, you think you can take advantage of my generous and good nature? Think you can get away with doing things that break my trust? Well sorry, but, that’s not what I call a friend. Friendship should be a two-way street. It’s not just about what you can get from someone, it’s about what you can give. A true friend should be someone you can trust with secrets and who respects you. Dictionary.com says a ‘friend’ is: “A person attached to another by feelings of affection or personal regard.” However, friendship goes beyond simply caring about someone. It means that the care you have for someone causes you to do things with and for that person. Let’s think about the second definition they give: “a person who gives assistance; patron; supporter”. Is that what my friendships look like or am I the only one who is caring and giving support? Someone who truly cares about you will be honest; they won’t do things behind your back or just use you. So, where do we go from here? For me, I’m in the process of, and have already, weeded out some of these negative influences in my life. It’s really hard because of the connection and years of memories with these individuals, but I feel it is necessary for me to move forward. I’m a life-long learner and I’m always trying to make myself better. Right now I’m learning that sometimes in order to move forward you to have to let go of the things behind you. To end on a positive note, here is a fun video of Rhett and Link, “Just Being Honest”. I totally understand now how frustrating it must have been for you making meals for us as kids, only to have us reject your dishes. “It’s really gooood.” You’d say. But we would just turn our nose up at it. But you sacrificed your time, money, and hard work to make us a good and healthy meal. Now that I’m older, I wish I would have appreciated your work and tried more of what you made for us. When I make my own meals and people don’t want to try it, I get a bit frustrated and angry inside too. Then I think back to how you must have been feeling when we did the same thing to you. So, I’m sorry mom for all the trouble I caused. I want you to know I appreciate you! You may not be a professional chef, but you’re the best cook in the world to me! Plus, you taught me a lot of what I know about life and the kitchen! High school is long over and done with for me. It was a time of growth and change. In grade 12, I made an educated decision to become vegan. I read books, watched the movie “Forks Over Knives”, and searched out more information on making the change. First I started out vegetarian, but eventually made my way to a vegan diet. Since entering post secondary, the diet was much more difficult to maintain. With the many tempting food options in residence, and hardly anything vegan, I caved in. I even ended up eating fish and occasionally meat (chicken). I look where I am now and am not satisfied. I originally made the change to a vegan diet for multiple reasons – health, treatment of animals, etc. However, there’s no time for change like the present, right? So, I have decided to go back to a vegan diet. It’s going to be a bit of a change again. I don’t eat much dairy anyways, but the little I did eat, I’ll be cutting out. I’ll also be removing fish and eggs from my diet. I know it will be a little work, but in the end it’s worth it. I feel better eating vegan. So here’s to starting over! 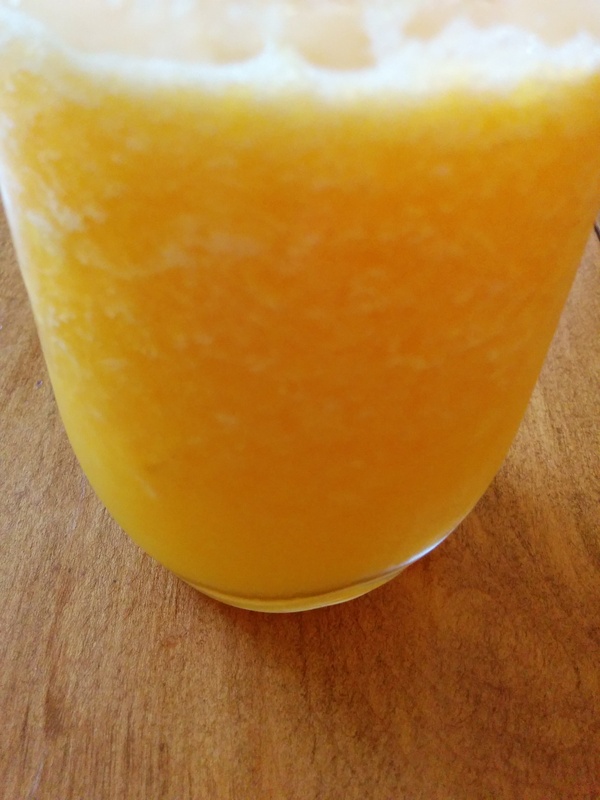 For my breakfast this morning I made an orange slushy and had some leftover pesto pasta! This time I’m more determined to keep up this choice. I also dowbloaded the Yummly app on my phone and subscribed to the Vegan Society emails to help me on my journey. Looks like I’m starting off on the right track! What are your diet and life goals? I know I haven’t been on here for the last few weeks. First my birthday happened and then I got sick (which I’m still recovering from). Anyways, I finally have writing inspiration – peanut butter and smoothies! What a great combination! Yesterday I was really in the mood for PB, but I didn’t want a sandwich. Then I thought about making a smoothie. I had some fruit in the house that I could use up. So it seemed like a wonderful idea – after all, I really love smoothies! In my search I came across a Peanut Butter Jelly Smoothie recipe on Yummly. I did make a few additions to it, but let me tell you, this was delicious! It’s my new favourite smoothie recipe and I will definitely make it again! 4 ice cubes (I added this to the recipe. Though maybe 2-3 would have been enough). Using a blender, first crush the ice. Add the other ingredients and blend, (on a medium setting), until thoroughly mixed and smoothe. Do you like smoothies? If you try this one, let me know what you think! What are your favourite smoothie recipes?